They come in different shapes and flavors, but every American refer to it by one name: Girl Scout cookies. They are named after Girl Scouts of the USA (GSUSA), whose members sell these baked goods to homes across the country to raise funds. Cookies and the Girl Scouts have a long history together, dating back in 1917 when the Mistletoe Troop in Muskogee, Oklahoma, sold the cookies they baked in a high school cafeteria. Years later, the organization suggested cookie sales as a fund raiser and other troops and councils picked up on the idea. 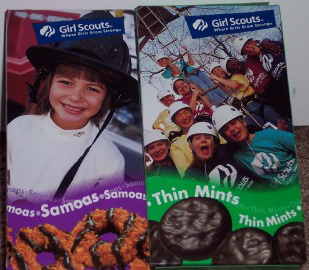 The girl scouts are given prizes if they are able to sell certain number of boxes. These prizes range from stuffed animals to Girl Scout camp credits. In some councils, that number adds up to the troop total, which uses the sales from these cookies for trips or other expensive activities. This type of funding raising teaches the scouts valuable skills in planning, teamwork, finance, organization, communication, and goal setting. The girl scouts used to sell these cookies door-to-door, but a growing concern for their safety has prompted some troops to put up cookie booths instead, where the scouts sell the cookies in a public area under the supervision of an adult troop leader. Some councils even offer the option for customers to sponsor boxes of cookies that will be sent to servicemen and women. As of 2007, about 200 million boxes were sold every year. As of this posting, there are about 28 different varieties of Girl Scout cookies available. Some varieties go by different names, depending on the company that makes them. The most popular cookies include Thin Mints (thin, mint-flavored chocolate wafers dipped in a chocolate coating); Samoas (vanilla cookies coated in caramel, sprinkled with toasted coconut and laced with chocolate stripes); Tagalongs (crispy vanilla cookies layered with peanut butter and covered with a chocolate coating); and Trefoils (traditional shortbread cookie made in the shape of the Girl Scout trefoil). So the next time a girl scout asks you to buy some cookies, buy some. You are giving them much more than the cost of these cookies, such as confidence, kindness, and happiness. Belgium is one of the few countries in the world known for its delectable fine chocolate. How this small country become home of some of the best chocolatiers, however, is not so sweet. It began in the 1880s, when Belgium was ruled by King Leopold II. He laid the foundations in controlling the Congo Free State (present-day Democratic Republic of the Congo) in Africa that provided easy access to the vast cocoa grounds. Belgium continued to import cocoa from Congo despite war was raged by the African slaves. It is said that about 10 million Congolese were murdered during Leopold II’s reign. It was in 1912 when Belgium made a mark in the chocolate industry when a Swiss family based in Brussels, the Neuhaus, created the praline. This confection was the first buttercream-filled, bite-sized chocolate, which was filled either with nuts or cream and coated with milk chocolate. These pralines were sold in a special packaging called Ballotin, deep cardboard boxes with overhanging edges, which has since became a standard in packing different types of fine chocolate. 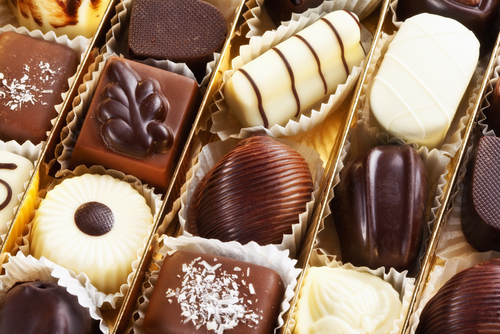 Today, several well-known chocolatiers traced their roots in Belgium such as Neuhaus, Leonidas, Godiva, and Nirvana. They still create the most luscious pralines, as well as truffles, ganache, and other tasty confections that the whole world enjoys. Max Brenner is probably one of the most recognizable names when it comes to fine chocolate making. It started in 1996 when Max Fichtman and Oded Brenner joined together to form Max Brenner and opened its first store in Israel. Three years later, it added nine other stores which showed the interest that even people in the Holy Land may have for chocolate. This love of chocolate went international as Max Brenner became an international chocolatier when it entered the US market in 2006. It has since been associated with fine chocolate making as shown from its wide range of chocolate products. And with the interest in all things chocolate ever growing, Max Brenner has also expanded its product range that now also includes chocolate drinks, cookies and other specialized treats. Unique ingredients have also become part of its various distinct chocolate creations that provide people with a wide range of choices not only limited to the traditional chocolate fare. It all may have stemmed from this chocolatier’s philosophy that chocolate is more than just merely a matter of taste experience but also encompasses a wider range of emotions and aspects of life.